This tutorial is for those who want to control the media volume on Android through their Gear 2. It can also be used without the Gear 2 part, if you are only interested in the tasks themselves. First, make sure you were successful in getting Tasker to work with the Gear 2. If you just want Volume Profiles to be triggered by Tasker, go to the bottom of this post! Open Tasker and press the 3-dotted button on the top-right and select Preferences. 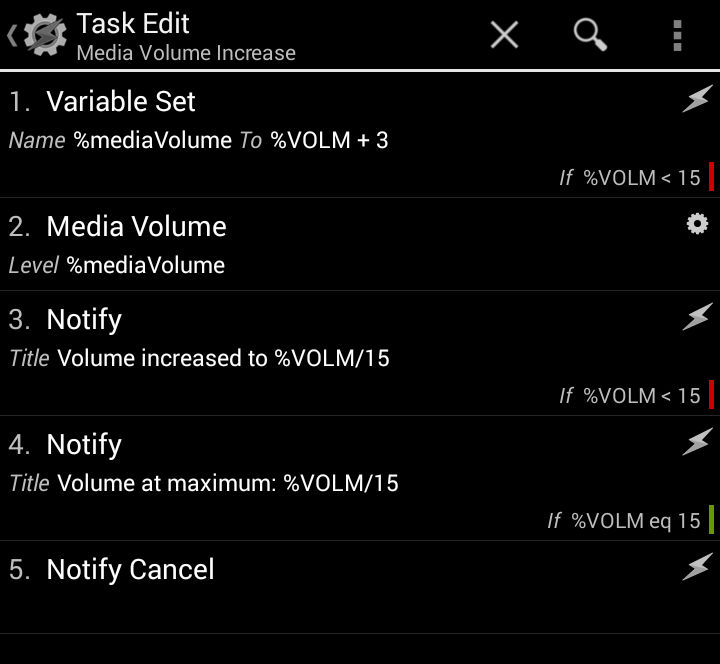 Create a new task and name it: Media Volume Increase. Press + and select Variables, then Variable set. Press + and select Audio, then Media Volume. Do not check Display or Sound unless you really want to (for a test). Add the application icon (for the Gear 2) by using the button on the bottom-right. Back (you should be at the task list now). Press the 3-dotted button on the top-right and select Preferences. Check the Beginner Mode (or not, if you know how to export apps without). Back (to the task list). Press & hold Media Volume Increase -> 3-dotted button on the top-right -> Export. After the export is done, press the Android robot icon on the bottom-right of the popup. Open Gear Manager -> Notifications -> select Media Volume Increase. Gear Manager -> Samsung Apps -> Find and install LaunchGear. Open LaunchGear on the phone and add Media Volume Increase. Open LaunchGear on the Gear 2 and test out your new app. Create a new task and name it: Media Volume Decrease. Press & hold Media Volume Decrease -> 3-dotted button on the top-right -> Export. Open Gear Manager -> Notifications -> select Media Volume Decrease. Open LaunchGear on the phone and add Media Volume Decrease. Check the [Guide] How to set up Galaxy Gear 2 for non Samsung devices for errors. Install Volume Profile for tasker and create a profile called Outdoor (as an example). Edit the Settings of Volume Profile to disable vibration and sound on profile change. 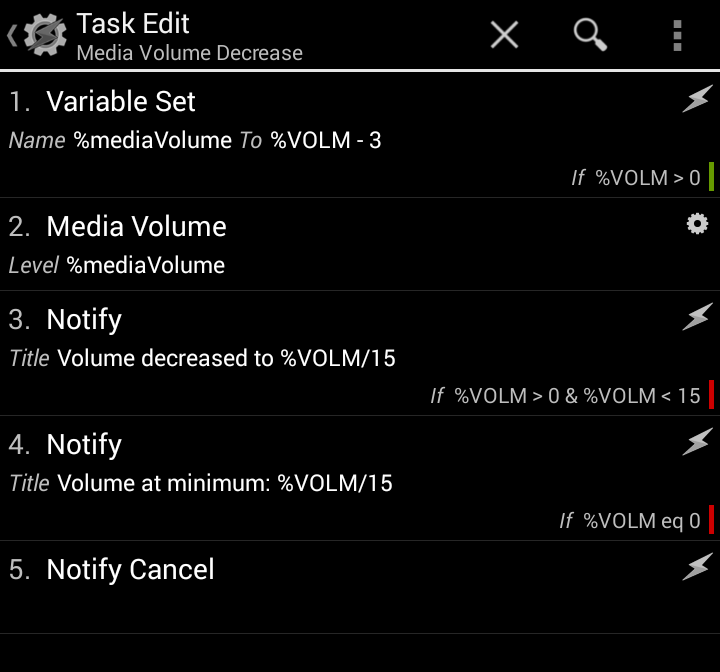 Open Tasker and create a new task and name it: Set outdoor volume profile. Press + and select Plugin, then Volume Profile -> Configuration: Outdoor. Press & hold Set outdoor volume profile -> 3-dotted button on the top-right -> Export. Open Gear Manager -> Notifications -> select Set outdoor volume profile. Open LaunchGear on the phone and add Set outdoor volume profile. Open LaunchGear on the Gear 2 and test out your new volume profile. Yes, lots of steps but once you create 2-3 apps, everything will seem easier 🙂 Now enjoy your new apps for controlling your phone with your Gear 2 while going for a run! Similar apps can now be easily created, for example: increasing/decreasing any other type of volumes on the phone (ringer, alarm, notifications, etc.) but the media volume should be the most useful. For complex alarm/ringer settings, use Volume profiles. 23.07.2014 – added steps to automatically remove the generated notifications on the phone using Tasker (step 11 for first two apps, step 8 for the last one).